Martha Finley was the daughter of a Presbyterian minister, was a school teacher and author of numerous articles, essays, and books, the most well known being the 28 volumes of her Elsie Dinsmore series. Enter the world of Elsie Dinsmore! These nineteenth-century fictional chronicles of a beautiful young heiress in the Civil War South have captivated generations of 10to 14 year-old readers eager to follow Elsie's life from childhood to motherhood and beyond. Covers feature custom illustrations. Elsie's Motherhood, Book 5: Happily married to Edward, Elsie takes great delight in her family. What will happen when they are confronted by a powerful adversary? 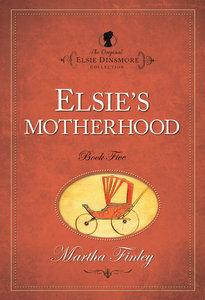 About "Elsie's Motherhood (#05 in Original Elsie Dinsmore Collection Series)"
Customer Reviews For "Elsie's Motherhood (#05 in Original Elsie Dinsmore Collection Series)"
Elsie's Motherhood is the fifth book in the Elsie Dinsmore collection. An accident that narrowly misses killing Edward upsets the family routine. When life gets back to normal, a cousin from Scotland brings a special talent to Elsie's door. I really enjoyed this book and couldn't put it down. It is a great book in a fantastic series for girls aged 8-14.